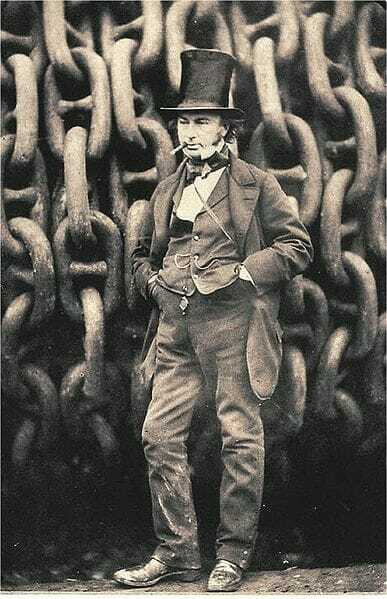 Isambard Kingdom Brunel, The SS Great Eastern and Millwall. The famous engineer Isambard Kingdom Brunel has a couple of close connections with the East End of London. He worked on the world’s first underwater tunnel, the Thames Tunnel, with his father Marc Isambard Brunel. This tunnel crossed under the Thames from Wapping to Rotherhithe. In his later career, he also built and launched one of the world’s greatest ships, the SS Great Eastern, from Millwall’s docks. To Brunel, the SS Great Eastern was simply known as the “Great Babe”. By the time the SS Great Eastern launched in 1858, it was the biggest ship ever built and one of the few to have five funnels. It could travel around the world without the need to refuel and could carry around 4,000 passengers. The ship measured a whopping 692 feet in length. It was estimated to have six times the volume of any other ship at the time. Its design also incorporated a double-skin hull. This is now compulsory when ships are built as it increases safety, but, at the time, it was a fairly innovate addition. This feature was not used again after the building of the SS Great Eastern for many years. Brunel’s idea for the ship started to take shape when he met the Millwall shipbuilder, John Scott Russell, at the Great Exhibition in London. Russell believed that the ship could be built and, with the backing of the Eastern Steam Navigation Company, the two of them started to put Brunel’s plans into practice. Work began on the SS Great Eastern in 1854. One of the first problems that Brunel and Russell encountered was where to build such a large vessel. Due to its size, a specially constructed dock would be needed to build it in the traditional way so that it could launch forward. This would be an expensive solution. Russell suggested that they should lease docks at Millwall and that they should build the ship sideways to compensate for its size. They devised a plan that could also launch the ship sideways. Work in the ship was delayed due to Russell’s bankruptcy. The Eastern Steam Navigation Company took control of the project and they agreed a launch date of the 3rd November 1857 with Brunel. Brunel had not wanted to make a fuss over the launch; however, the Eastern Steam Navigation Company thought this should be a great occasion and sold tickets to 3,000 people so that they could come and watch. The launch itself was a bit of a disaster and was no doubt disappointing to the excited crowds. The machinery that was supposed to pull the ship sideways into the river failed. Brunel had to attempt the launch again on the 19th of November and again on the 28th. Both attempts failed to move the ship into the river and it was not launched until the 31st January in the following year. Nothing much happened after the launch, as the ship was not yet fitted out. The plan was to set sail in August 1859; however, it could not start its maiden voyage until the 6th September. The maiden voyage was a leisurely run from Millwall to Weymouth, from which point it would make a trial crossing of the Atlantic. However, on the way to Weymouth, there was an explosion on board that destroyed much of the forward deck, killed five stokers and injured other members of the crew. It took until 1860 before the SS Great Eastern could make a trip to North America as planned. The ship made a few voyages across the Atlantic, but was ultimately sold and chartered to the Telegraph Construction and Maintenance Company. The aim was to convert the ship so that it could take on cable laying projects as the company was trying to lay down telegraph cable to connect Europe to North America. During perhaps its most famous trip, the SS Great Eastern laid down the first 4,200km of transatlantic telegraph cable in 1865 and between 1866 and 1878, it laid down a total of 48,000km of cable, helping the world to communicate more effectively. The SS Great Eastern ended its life as a floating music hall, gymnasium and advertising hoarding – a far cry from the lofty plans of Brunel, who died shortly after its maiden voyage in 1859. The ship was broken up in 1889 in Liverpool and it took the wrecking company 18 months to pull the ship apart. The top mast of the SS Great Eastern was salvaged by Liverpool FC and was used as a flagpole at their ground at Anfield. If you are visiting Millwall today, you can still see the launch site of the SS Great Eastern on the docks. Some of the slipway has been preserved, and if you visit at low tide, you can see more of it running down into the Thames.